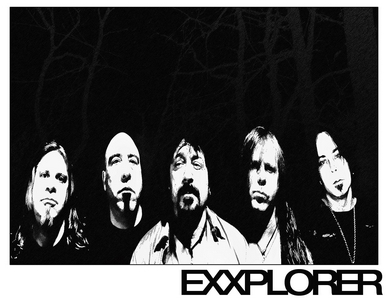 Exxplorer, the legendary American band are back with the new CD Vengeance Rides An Angry Horse and we find Kevin Kennedy and Fred Gorhau with the help of their new label Pure Steel Records for this cool promotional and confidential interview.... Enjoy!!! Hi Fred! Just a great come back with Exxplorer!!! Which is the cause for that? What is the spark that light up this reunion? Kevin Kennedy: Hello Umberto.. Thanks so much. We do think it a good effort for us. And the main reason for it, was we were all determined to show we have a lot more fuel, left in our souls!! Fred Gorhau: Hello Umberto, thank you so much for doing this interview. We all really wanted to do a new album, and the requests we have been getting during the past couple of years just made us want to even more. When did you start writing the songs for Vengeance Rides An Angry Horse? Where did you record and how long did it take? Kevin Kennedy: Well some of the writing, was from awhile back.. But most was written together over the last 16 months or so, we recorded @ our good friends home (Bill Haughey). And he saved our asses... Because of our poor economy here, we had almost no budget to work with. Fred Gorhau: Most of the songs on this album are new. There were a few things from awhile back that we re-worked. After this album, have you any plans for a video? Fred Gorhau: Yes, we would love to do a video. It's something that really helps put the song out there, and it's a great way to represent the band. We will have to work out the details as to which song, and where we will do it. Fred, you have a YouTube channel, how important is it these days for a band to actively use the internet? Fred Gorhau: It really does help. It's a great way to introduce yourself to new fans, and to show old fans what you have been up to. How is your new partnership with Pure Steel Records? Fred Gorhau: Yes, Pure Steel has been great. We are very happy and fortunate to be on a label that supports this band. Which is your equipment in studio and on stage? Kevin Kennedy: I have a great couple of amps.. A Ceriatone Plexi - made by my friend Nik Azam.. And a (1981) J.C.M 800. And we use the Digitech-1101 processoers and the Remote 2-Foot Pedals, Gibson Exxplorer, Les Paul and Raven West guitars. 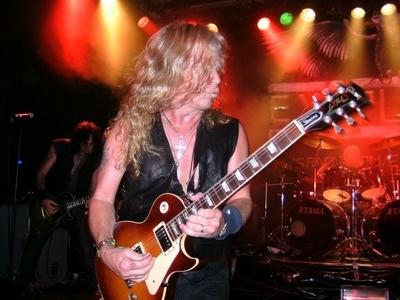 Fred Gorhau: I have a 1978 Marshall 100 watt head, a Marshall 9200 Dual Monoblock, Marshall 4x12 cabinets with 25 watt Greenback, a Digitech 1101, Gibson Flying V and Les Paul Standard, plus 2 Raven West guitars. Raven West is a great guitar company, and they just gave Kevin and I an endorsement. In these past years you and Exxplorer have done some concerts at some festivals, but only in Germany.... Any hope to see you in some festivals in Europe? Kevin Kennedy: We would love to play Italy, Greece , Belgium, and everywhere else in Europe... As well as returning to Germany. Fred Gorhau: We really hope so. We would love to come back to Europe, we hope to be able to stay longer and play in many more places next time. How is the response of zines and fans worldwide about Vengeance Rides An Angry Horse? Kevin Kennedy: The response has been absolutely amazing and overall supportive. Fred Gorhau: So far the response has been fantastic. We are all very happy and proud of what we have accomplished with this album. Kevin Kennedy: We are all actually from New Jersey.. (close To NY).. And NJ used to be one of the hottest places to have a metal band.. But times change and the scene here is not what it used to be. Mainly due to the strict drinking laws.. Many large clubs closed down.. And the metal is not as much old school style here as in Europe.. But we hope to influence some change. Most of the people know the most your first legendary album, please describe to us your first 3 albums! What do you think about the albums now? Kevin Kennedy: Our first was amazing, because as kids... I was only (22) years old in 1982. We did not even realize we were in the midst of an all-time classic. And a recipe for power is very good, but if you listen close you can hear the change, because things happened to delay its release and we got older, and  tried to be a bit more commercial. Songs like Beg Borrow and Steel and Ride The Storm sound like S.O.S. because they were recorded immediately after. Then a big time lapse took place and more commercial songs Like Rock The Nation were written and recorded. By the time we were starting on our third album. The grunge sound had taken over the airwaves, I did not like it and did not want to change!! So shortly after I had tried to hold my ground and Lennie was willing to come back, but Ed had taken a liking to Barry Hocking Jr., so I knew it was my time to leave. And I did, but I am happy that I stood my ground. And history proved my point (stay true to who and what you are), if you walk in someone's footsteps, you will surely fail!! Even if there have been long periods where the band was inactive, do you have any plans for 2012? Something special to celebrate the founding of the band 30 years ago? Kevin Kennedy: We plan a huge celebration in 2012. I have the journal written of Exxplorer's very first rehearsals incl. the very first  rehearsal and the songs we played which incl. (WW111). The shirts are going to be beautiful! Exxplorer's 30th anniversary! Fred Gorhau: Well, we definitely want to tour to support this album in 2012, and then start working on the next one. We have nothing official yet, but there will be something special for the 30th anniversary. We'll keep you posted. Try to promote your new CD! Give us a reason for buying it and give a salute to your fans at Ice Vajal... Please say Hello to Lennie Rizzo!!! Kevin Kennedy: We promise you all that we put our blood, sweat and tears into writing and recording the new album. We hope you like it and our best is yet to come and hopefully the next album can be recorded with a real budget as we were pretty bad off financially and we salute you all @ Ice Vajal!!! Thank you! 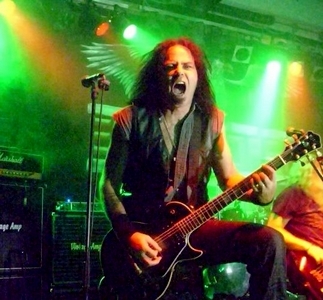 Fred Gorhau: If you like US power metal, this album is for you. We went in the studio with no other goal except to write an album of songs that Exxplorer likes. Since we have a lot in common with our fans, we're pretty sure you will enjoy it. Put it on, and turn it up... Thank you Ice Vajal! And Lennie says "Hello"!!!!!! Well....what can I say more??? It's time to buy and listen this new album because I don't want to wait more than 15 years for a new album of this band!!! !